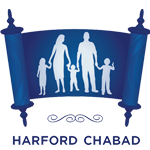 Harford Chabad Chai Partners make a special commitment to inspiring the future of Jewish life in Harford and Cecil Counties by providing steady, reliable core funding for Harford Chabad. Thanks to your monthly pledge, we know we will have the funds when needed to respond to a call from a local rehab for a young, lonely person in recovery needing reassurance from a rabbi, or a local family wanting the rabbi to visit to discuss personal issues. Visit seniors at assisted living or retirement communities. Share Jewish learning and teaching with those who can’t afford to learn it otherwise. Give children scholarships so financial hardship doesn’t stop them from learning about their heritage. Create a safe place for people to explore their Jewish heritage without being judged for lack of practice. By becoming a Chai partner, your support ensures our ability to focus on inspiring you and others, without interruption. Plus, you’ll never need to write another check or send in another renewal—and you will help us save money on administrative fees, so even more of your gift goes to help right away. Your gifts will have a big impact. Just $18 is a great investment in a Jewish future! Online enrollment takes just moments please become a Chai Partner today, at www.HarfordChabad.org/Chai or return this form at your earliest convenience. Becoming a Chai Partner is as easy as 1 2 3 and is a convenient and efficient way to make your support of the Jewish community go further. Sit back and relax, knowing you are inspiring a community and making a difference in the future of Jewish life in Harford and Cecil Counties. The monthly gift you select will automatically be contributed to Harford Chabad through your credit card or checking account (like an automatic check), on the first of the month (or next business day). Over 20% of local funding comes from generous Chai Partners like you who have made it possible for Harford Chabad to inspire. Will you show your support for an inspired Jewish future? It’s incredible that for less money than buying a sandwich and a cup of coffee each day, you can inspire a Jewish child to love their heritage! Thank you for joining as a Chai Partner today. Please become a Chai Partner today, at www.HarfordChabad.org/Chai or return this form.